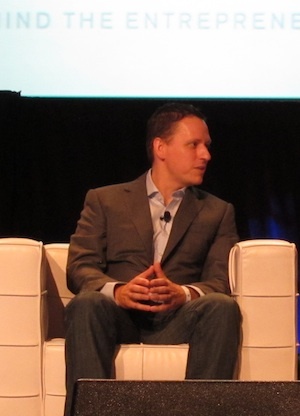 Peter Thiel Has New Initiative To Pay Kids To "Stop Out Of School"
Today at our TechCrunch Disrupt conference in San Francisco, Clarium Capital President Peter Thiel sat down with our own Sarah Lacy to talk about a whole range of issues. But at the end of the dicussion, he disclosed a bit of news. The basic gist is that he will fund up to 20 kids under the age of 20 who apply for this grant. His hope, obviously, isn’t to ruin their lives, but instead to find the best minds thinking about big things early in life. This is where true disruption comes from, Thiel believes. And it also solves another problem that many young people face today: crippling debt. Because going to college is so much more expensive than it was even when Thiel was in school, he notes that a lot of kids come out of school having to worry about debt rather than just focusing on doing great things. Thiel hopes to change that. He’ll be accepting applications for this grant through the end of the year for enrollment in 2011. Hope Vivek doesn’t read this post.